On the 9 January 2018 a ban on the manufacture of products containing microbeads came into force in the UK – a landmark step in the introduction of one of the world’s toughest bans on these harmful pieces of plastic. What are microbeads? Microbeads are tiny solid plastic particles that can range in size from ten micrometres to one millimetre. They appear in a wide range of skin care products, acting as an exfoliating agent before being rinsed off and down the drain. Although they are tiny, and may seem harmless, an average of 100,000 microbeads are washed down the sink with a single application of some products, ending up in the sea and the food chain. Manufacturers of cosmetics and personal care products will no longer be able to add the tiny plastic pieces to rinse-off toiletries such as hand soaps, face scrubs, toothpastes and shower gels. The ban on the manufacture of products containing microbeads will be followed by a ban on the sale of such products in June 2018. The main reason why microbeads are being banned is because they have a massive impact on marine wildlife, and has major implications for humans as well. 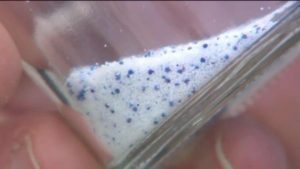 Microbeads are a particular problem, with marine animals ingesting them as food. This then means that plastic becomes part of the food chain – potentially putting people’s health at risk. The UK’s ban – praised by campaigners as one of the toughest in the world – will help to stop billions of microbeads ending up in the ocean every year. According to a recent report by the House of Commons Environmental Audit Committee, there is currently somewhere between 15 and 51 trillion microbead particles in the oceans, with anything from 80,000 to 219,000 tons entering the sea from Europe each year. Our Supplier Deb had the following to say on the microbead ban, “As our understanding of the world evolves and the consequence of the inclusion of microbeads into products has become better understood, there is now concern that the material is building up in oceans across the world, potentially damaging wildlife and entering the food chain. Whilst plastic microbeads from cosmetic and personal care products are a very small contributor to the wider marine micro-plastic litter, estimated at 0.29 per cent, we still recognise the importance and significance of removing them from cosmetic products. For those companies that have not yet switched from microbeads, it is critical to do so as soon as possible as there will be a complete ban on the sale of products containing microbeads on 30 June 2018. Luckily, there are a number of natural alternatives that can be used to replace the role of microbeads in the production process – including cornmeal, olive stone, walnut shell and perlite. These all provide a similar exfoliating effect, without the environmental harm caused when they end up in the waterways. However, the effort to create more environmentally friendly production process does not end with changing ingredients. There is another way in which skin care companies can boost their green credentials – by changing the formulation of their products to reduce the volume required at each application. One method for achieving this is to create foam-based products that work just as effectively at a lower application volume. This would mean that, for an equivalent number of hand wash events, users and their employers will be able to significantly reduce the amount of chemical consumed. The result of such a change would see each pack of product lasting longer – requiring the use of less plastic, less cardboard, and less fuel for deliveries. The knock-on effect of this would be the simple fact that over time, companies can significantly reduce the amount of product they manufacture. This ultimately means less plastic produced, consumed and wasted – not to mention the reduction in energy use. It is an all-round more environmentally friendly way to do business. Investing in new processes and technologies to reduce the environmental impact of skin care products is an investment in the future. It is something we should all be doing our best to achieve as soon as possible. What is organic food and why has it become so popular? According to the Soil Association sales of organic food to caterers grew almost 8 per cent to £90.9 million in the UK in 2018.